What Else Can You Expect from Your New Windows? Window salespeople make many claims about energy savings. How accurate are these claims? Good quality windows, installed correctly, can yield substantial energy savings. How much you save depends on the type of window you choose and the type and condition of the windows you are replacing. In the average home, 38 percent of the heat loss is through windows and doors. If your home has drafty single-pane windows or single-pane aluminum sliders, the heat loss from windows may be as much as 50 percent. The weaker the performance of your old windows, the more dramatic the savings and the sooner energy savings alone will cover the cost of your new window investment. Air leakage in and around windows is a significant factor in the window’s overall thermal performance. Regarding air leakage, the best window is fixed; that is, can’t open or close. There just aren’t any gaps and openings for air to find its way through. While useless for ventilation or for escaping a fire, fixed windows may be an excellent option in specific locations. Nearly as good are “casements” or awning-style windows that crank open and closed. Because the seals are compressed slightly when the window is closed, it is difficult for air leaks to develop. The least efficient opening style is sliders. Many people select sliders simply because that is what they’ve always had. There are plenty of good sliders on the market, but they have to rely more on other features, such as low-E coatings (see below) and more glazing layers, to deliver top energy performance. Sliders, which have more joints and gaps, are also more susceptible to air leaks as the seal's age and get worn or lose their resiliency. For typical residential windows, most homeowners choose vinyl or wood. With vinyl windows, avoid frames that are held together with screws because they tend to loosen over time. Instead, look for “welded” seams, where either heat or chemicals have been used to fuse the joints. Regarding energy savings, wood and vinyl are comparable. Some people prefer the aesthetics of wood, though it lacks the maintenance-free aspect of vinyl. First, the enclosed air and other gases are effective insulators. The more enclosed spaces the window has, the less heat can escape. Each layer of glass also provides more surfaces for low-E coatings. Some windows use a plastic film suspended between two layers of glass to achieve a triple-pane effect at a lower cost. While plain air is an excellent insulator, some fill gases, like argon, krypton and carbon dioxide, are even better. The gas or combination of gases affects the window’s overall thermal performance. One element of the NFRC rating system doesn’t account for, however, is the long-term durability of the product because it rates the window only when it is new. The NFRC gives each window a U-factor rating. The U-factor is the inverse of the more familiar R-factor used in attic insulation. So a U-factor of .5 equals an R-factor of 2. The lower the U-factor, the better it is. The U-factor marked “BB,” or “Non-Residential” is for commercial window applications. Use the U-factor rating to make meaningful comparisons. Be wary of a window vendor who won’t provide this number. The NFRC ratings don’t address window durability directly. If the windows warp, leak or loosen over time, their U-factor ratings are likely to plummet. Your best resource for choosing a durable, problem-free window is to rely on the advice of a reputable installer, such as Franciscus Incorporated who will be interested in your long-term satisfaction and will quickly steer you clear of windows that don’t hold up well. You can also inspect the window before buying. Look for a good fit between parts. Slip a business card between any slid-able sashes and the frame. The card should slide, but there should be some resistance. Low U-factor ratings and durable construction are both determined by attention to details. In general, the better-rated windows will be better made as well. The Franciscus Incorporated Team Can Replace Your Windows! Are you ready to get started on your window replacement? Then you've come to the right place! Our qualified team members here at Franciscus Incorporated would be more than happy to assist you. 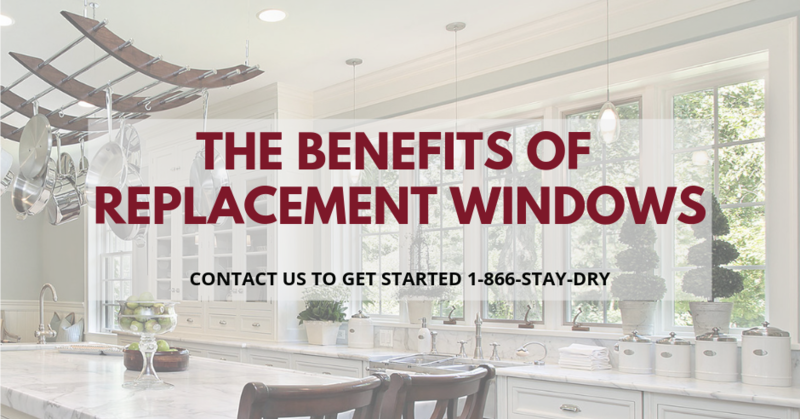 Please feel free to give us a call at 1-866-STAY-DRY to learn more about all of our available window replacement options or to get started. We look forward to hearing from you and hope to work with you very soon!